The beauty of having an open API (Application Programming Interface) is that anyone can develop a connection with Xero, be it custom software, other software products, or as is the case recently, web hosting management software. As you’d expect, the boys and girls in the web hosting industry are a pretty tech savvy bunch, which is why many prefer to use modern, cloud based accounting software to run their businesses. Web hosting has quite specific software needs with almost everything automated including sign up, provisioning and billing. One of the leading products in the market is WHMCS (Web Hosting Manager’s Complete Solution). Edge Hosting (http://www.edgehosting.co.uk/), a UK based provider of Magento Hosting, use this as the main piece of software to run their business – all it lacked was an accounting software integration. Having checked Xero out and liked the look of it, the Edge Hosting team set about building a module for WHMCS that would synchronize contacts, invoices and payments with Xero. Once complete, they realised others might also want to use the module. It’s now commercially available and sure enough dozens of web hosting companies have taken to using the module with Xero. This is a great illustration of why the API is so important to us at Xero. Niche industries can easily and quickly develop integrations between specialist applications and Xero, and if you want to release the integration on a commercial scale, the Xero ecosystem makes this possible. Check out Edge Hosting’s WHMCS Xero Integration module here. Love the way Xero can work with other companies, like a team! Great outcomes for customers and stronger product “lines”! @Rob sounds like you could use a hand getting your settings right. I’ve raised this with support and we will be in touch shortly to help you get up and running. People may be interested to know that this module does not work very well when it comes to VAT. The import into Xero runs daily. If an invoice is cancelled on the same day of it being created it will not be entered into Xero at all. Also make sure you disable “void cancelled invoices” as this will calculate a wrong/higher VAT figure as invoices should never be voided, they should be credited. I have wrote my own addon to fix this but not available for public use. Does the system allow you to map customers that already exist in Xero? If so than by using what field? 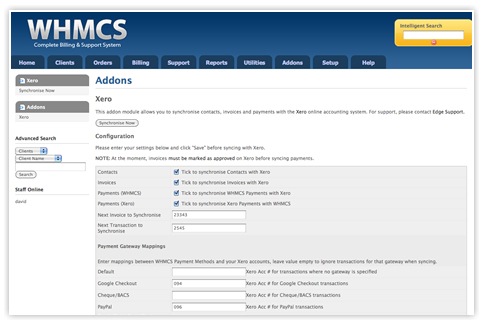 Our WHMCS system already has a payment gateway configured. Would both system talk to each other if payment is made in one system or another?